James F. Coyne, General Chairman of the 2015 St. Patrick’s Day Parade, announced plans for a city wide search for Chicago’s fairest Colleen. 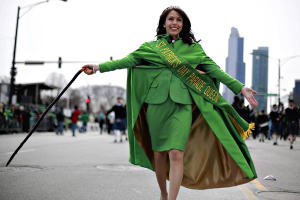 She will represent the Chicago Irish community as the Queen of the Annual St. Patrick’s Day Parade. The Queen and her court of four will be expected to attend civic, neighborhood, parish, and Irish events on behalf of the parade committee. Any girl of Irish ancestry, never married, 18-28 years old, is eligible to enter the contest. Entrants should send a snapshot with name, age, address, phone number and brief biography and explanation on why you want to be Queen. Contest finals will be held Sunday, January 18, 2015, in the Chicago Journeymen Plumbers Hall, 1340 W. Washington Blvd., Chicago, Illinois 60607. Deadline for entries is NOW TUESDAY JANUARY 13TH!